Motivation Monday: "What gets measured, gets managed." I don't know about you but I want to start this year off with a plan that'll support this year's success. What I'd like to share with you today is a tool that I chose to get serious about my finances. I set up a challenging savings goal and decided to accelerate paying off some debt. It was around that time I was reading Peter Druker's the Effective Executive. Peter's famous quote "what gets measured, gets managed" really struck a chord with me. That's when I decided to measure my financial progress until I reached my goals. The next action I took was to create an Excel spreadsheet which listed all of my debts and my (liquid) assets. I faithfully updated that spreadsheet monthly for two years making incredible progress during that time. Once I reached my savings goal I slacked off a little bit and my focus hasn't been the same ever since. So now I'm back in the swing of things and there's no time like the present to get started. This time I'm applying this tracker technique to various aspects of my life. I plan on updating on a weekly basis so I can view my progress and stay motivated. Too often, we think we're not making progress so we give up on our efforts way prematurely. I know I do this all the time, only to kick myself mentally later on, for not sticking to my plan. Can't tell you how many times I've asked myself "how far would I be by now if I would have kept going?" 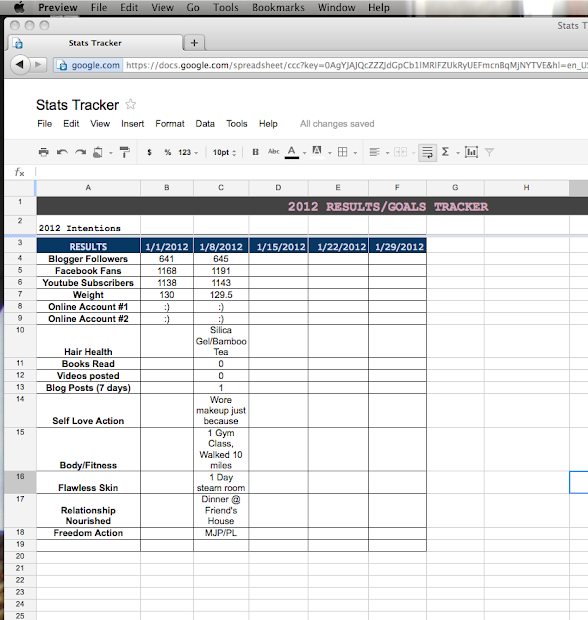 My new tracker will now serve as my accountability partner. As backup, I created a weekly electronic reminder so there's no excuse. If I miss a week or two here and there, I won't get discouraged and I won't give up. I'll simply pick up where I left off. This isn't about perfection, it's about progress. No longer will I wonder if progress is being made or if I'm backsliding, it's all there in black and white. As you can see from the screenshot above, this tool is not yet complete. I still have to include my written goals in the area next to "2012 Intentions." By doing this, I'll have my written goals in front of me on a weekly basis which will propel my progress. Notice that I'm tracking both results and actions. So in the case of statistical measurements (like my weight or how many fans on Facebook) I track the result, but in other instances, My focus is on taking consistent action. Now you might be saying to yourself, "why is she tracking things like "self-love" or "relationship nourished?" I do this because those areas of my life tend to be the first things that fall on the back burner when life happens. Adding them on the tracker keeps them top of mind for me. This list is by far incomplete as there are other areas I'd like to track my progress. Whenever something comes up that I'd like to include, I'll simply add to my list. The tool itself is a work in progress. I know that if I'm consistent, I'll make huge progress in the year to come. So what are some things you'll be trying to stay focused on your intentions for 2012? Wow!! I think I should do this! Thanks for the post! Just created an Excel spreadsheet like this myself, great advice you really see the results in black and white. Nice way to motivate! Optimum Care Heat Protection Polisher Giveaway! Monday Motivation: "Yesterday you said tomorrow." New 30 Day Supply of Bamboo Tea Available!